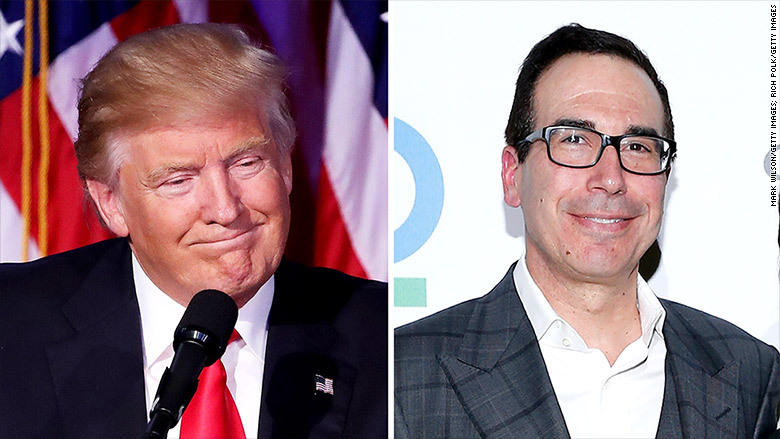 President-elect Donald Trump has tapped Steven Mnuchin, a former Goldman Sachs banker who profited from the housing meltdown, as his Treasury secretary, according to an official briefed on the decision. Mnuchin's career has been full of contradictions. He started as a Wall Street insider working for old-line firms before running a series of eclectic businesses -- including his own hedge fund and a West Coast consumer bank. In recent years, he has been a Hollywood movie producer. He served as finance chairman of Trump's presidential campaign and has been one of Trump's closest economic advisers. His nomination will be announced as soon as Wednesday, the official said. Democrats immediately signaled their strong opposition to the expected nomination, which would require Senate confirmation. In a statement, the Democratic National Committee quipped "So much for draining the swamp." The DNC added that "nominating Steve Mnuchin to be Treasury Secretary... is a slap in the face to voters who hoped he would shake up Washington." As Treasury secretary, the 53-year-old Mnuchin would be the face of the American economy around the world. The Treasury Department has expansive responsibility over business and oversees banking regulations, financial markets and the IRS. It has about 100,000 employees, an estimated 91,000 of them at the IRS. Besides co-signing the currency, the Treasury secretary is Uncle Sam's banker -- paying the bills, collecting taxes, managing the federal government debt and selling billions of dollars a year in Treasury bonds. Mnuchin, like his father before him, was a partner at Goldman. He worked for the firm for 17 years, joining at age 22 and leaving just before his 40th birthday, in 2002. He briefly joined the hedge fund of his former college roommate Eddie Lampert. Mnuchin still serves as a director of Sears Holdings (SHLD), of which Lampert is chairman and CEO. After less than a year, he left Lampert to work as a portfolio manager for the hedge fund of George Soros, the billionaire financier who has bankrolled liberal candidates and causes -- and who was depicted as a villain in Trump's last campaign ad. He only stayed a year, leaving in September 2004 to start his own hedge fund, Dune Capital Management. As a producer, he has put out films including "American Sniper," "The Lego Movie" and this summer's "Suicide Squad." His latest film, which opened right before Thanksgiving, is called "Rules Don't Apply." 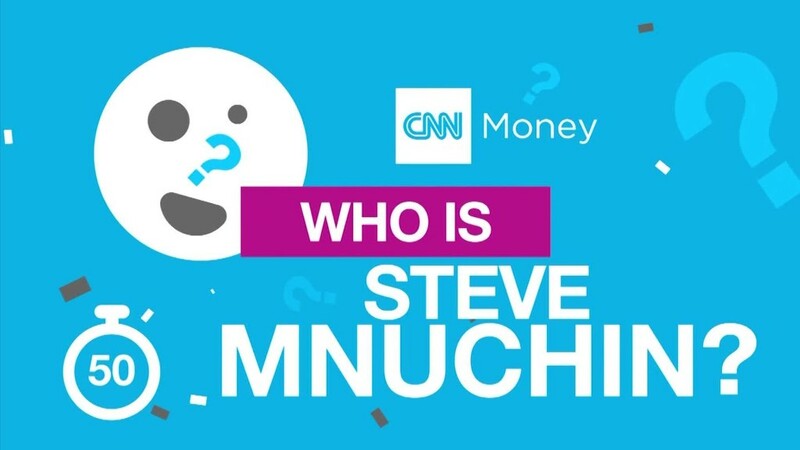 Mnuchin joined the Trump campaign as finance chairman in May, and sources tell CNN he made it clear early that he wanted the Treasury job. He recruited deputies before he was tapped for the job. Mnuchin has contributed to both Republican and Democratic candidates, including Hillary Clinton's Senate campaigns and 2008 presidential run. He gave to Barack Obama's Senate and presidential campaigns and to Charles Schumer, the new Democratic leader in the Senate. Steven Mnuchin joined the Trump campaign as finance chairman in May. Mnuchin and his brother were sued by the trustee trying to recover money for Bernard Madoff's victims after his Ponzi scheme unraveled in 2008. They were executors of their mother's estate, and had withdrawn her investment with Madoff shortly after she died in 2005. A court eventually blocked the trustee, Irving Picard, from collecting Mnuchin's mother's $3.2 million in profits withdrawn from the Madoff fund long before its collapse. Mnuchin led the group that bought failed subprime lender IndyMac for pennies on the dollar in 2009, about a year after the FDIC took over the California bank following a run on deposits by customers. IndyMac had become a poster child for the risky home loans that brought on the housing crisis and the meltdown in financial markets. The FDIC agreed to assume much of the losses as part of its sale to Mnuchin, who renamed it OneWest. But regulators soon questioned OneWest's foreclosure practices, which included so-called robo-signings that pushed homeowners into foreclosure without proper review or due process. The bank was one of many that agreed to pay millions in fines to compensate customers. Occupy Los Angeles protesters showed up at Mnuchin's Bel Air mansion. And this month, two fair housing groups in California filed a complaint with the Department of Housing and Urban Development, accusing the bank of discriminating against minority borrowers during his tenure there. Mnuchin eventually sold OneWest to CIT Group (CIT) in 2014 for $3.4 billion and joined CIT as part of the deal. When he left CIT less than two years later, he received a $10.9 million severance package.